Four handmade luxury cocoa butter bath truffles scented with essential oils and presented in a white snap-shut gift box. Our luxury bath truffles are loaded with cocoa butter and shea butter to moisturise and protect your skin leaving it super silky smooth. Scented with essential oils, these gently fizzing bath bombs slowly melt in the water releasing their gorgeous skin-nourishing oils. All you have to do is lie back and relax. 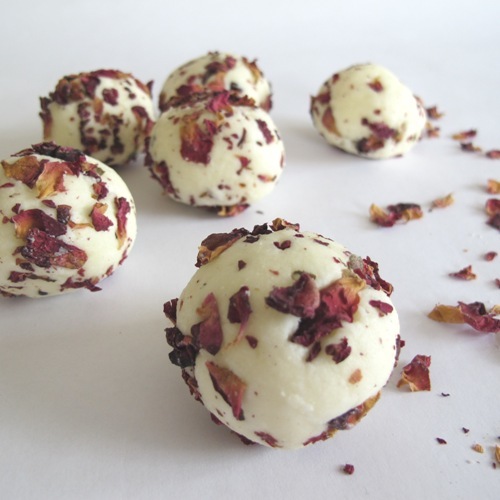 But if you can't decide which of our luxury bath truffles to try, don't worry. Choose the 'Mixed' option which contains one of each scent. Each truffle is handrolled so variations in size and shape do occur but each one weighs approx. 40g.